Classic White and Blue Yamaha Motorcycle Jacket is a very appealing and must have choice for all such people who are looking for something exclusive and different to carry this winter season. 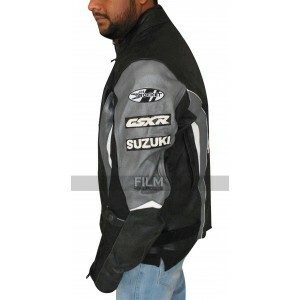 This jacket has been manufactured keeping in mind the look and demand of the leather material and at the same time the outlook of this jacket is also very simple yet trendy. The jacket has a blend of two distinct colors being white and blue as a classic choice. The front side of this jacket focuses on the logos, closure and rounded neck and at the same time the sleeves of this jacket are also full in length. This jacket has a zipped closure and the sides have two pockets. The inner of this jacket is provided with the viscose material as a lining and it ensures comfort as well as durability. Being a fan of all the motorcycle jackets I was unable to get my hands off from this jacket so had to order it anyway, however, as soon as my parcel came over I actually loved myself for making this level of quality purchase. "I cannot wear many layers of sweatshirts and jackets to keep myself safe from cold but this leather jacket made me realized that I really don’t need"
"I got it same as shown in image and my luck that i got free shipping too on Freddie Mercury jacket's purchase. Thank you Film Star Jackets "
"I had an eye on this jacket since I saw the trailer of the movie. So, I ordered and got it. This jacket is exactly the same as Chris appeared in the m"